Use rule-based investment strategies to maintain trading and investment discipline, and protect yourself from fear, greed, pride, and other costly emotions! Since the mid-1990s, assets under management in rule-based or non-discretionary hedge funds have outgrown those in discretionary or qualitative funds. Recent research shows that rule-based funds have outperformed discretionary funds on a risk-adjusted basis over the past 30 years, and have especially outperformed during recent financial crises. This is the first comprehensive guide to designing and applying these sophisticated strategies. 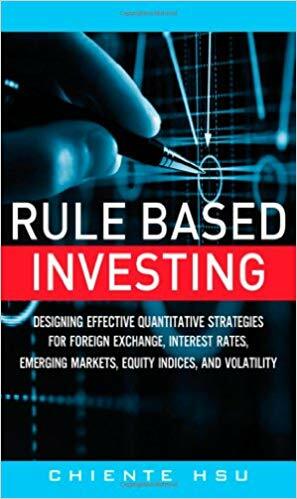 Combining academic rigor and practical applications, it explains what rule-based investment strategies are, how to construct them, and how to distinguish bad ones from good ones. Unlike any other guide, it systematically covers every facet of the topic, including Forex, rates, emerging markets, equity, volatility, and other key topics. Credit Suisse head of global strategy and modeling, Chiente Hsu, covers carry, momentum, seasonality, and value-based strategies; as well as the construction of portfolios of rule-based strategies that support diversification. Replete with realistic examples, this book will be a valuable resource for everyone concerned with effective investing, from traders to specialists in applied corporate finance.